The designation of the H1N1 flu virus as a pandemic by the World Health Organization (WHO) should, once again, prompt organizations to revisit their business continuity planning processes. However, recent conversations with Forrester clients reveal a potential gap in this planning — the role of the help desk or service desk in business continuity planning. 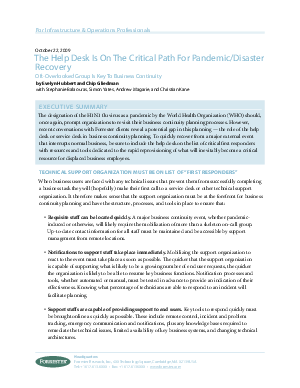 To quickly recover from a major external event that interrupts normal business, be sure to include the help desk on the list of critical first responders with resources and tools dedicated to the rapid reprovisioning of what will inevitably become a critical resource for displaced business employees.